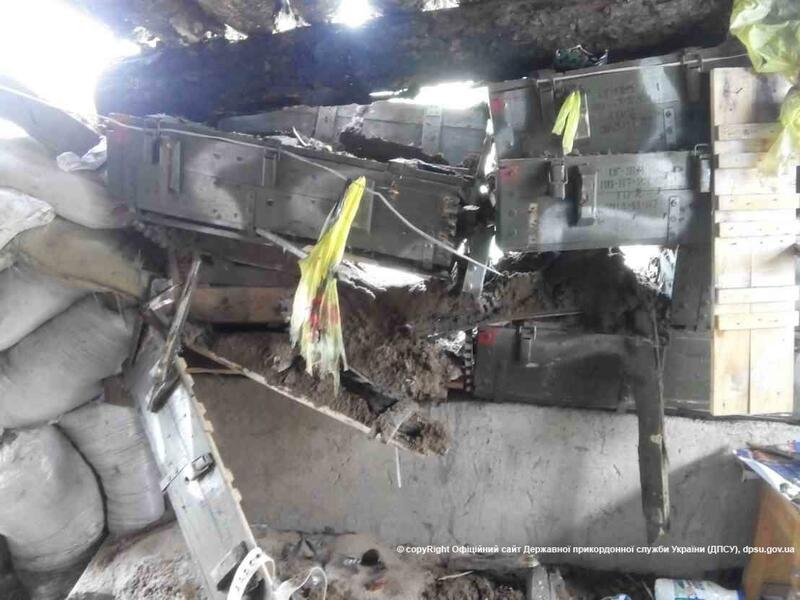 Today in the morning two terrorists attacked Ukrainian checkpoint “Stanytsia Luhanska” located on the way out of Lugansk to government-controlled part of the Region. The were moving in the line of people crossing the checkpoint from the side of LPR controlled territory. About 300-500 meters before the checkpoint they got out of the line and launched 2 grenades using RPG. 1 Ukrainian soldier was wounded. Civilians were not hurt. 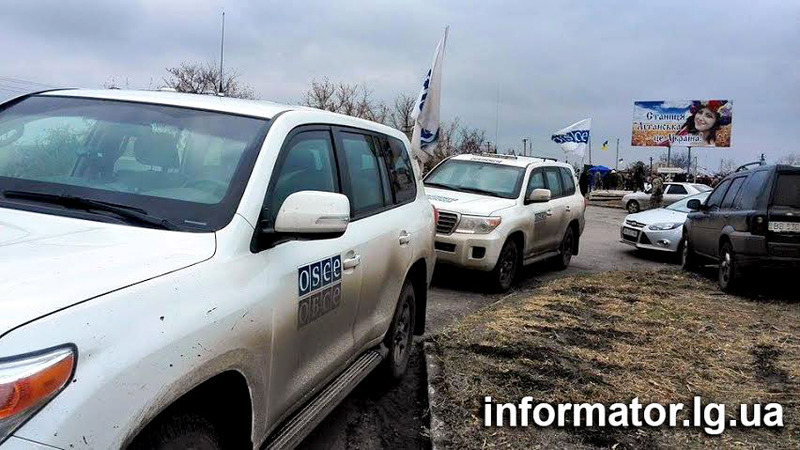 Locals reported that OSCE observers were at the place right after attack. Checkpoint got closed. 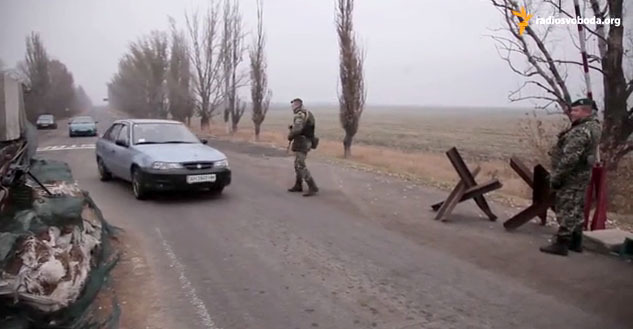 That was the only operating checkpoint in Luhansk Region. About 5 000 people were crossing that checkpoint daily. Today in the morning 2 unidentified men attacked Ukrainian Army positions located at “Stanytsia Luhanska” checkpoint. Two unidentified men who were moving in the line of people moving in the direction to the checkpoint “Stanytsia Luhanska” got out of the line in about 300-500 meters before the checkpoint and wend down to the field. After that they stopped and made two launches from RPG. 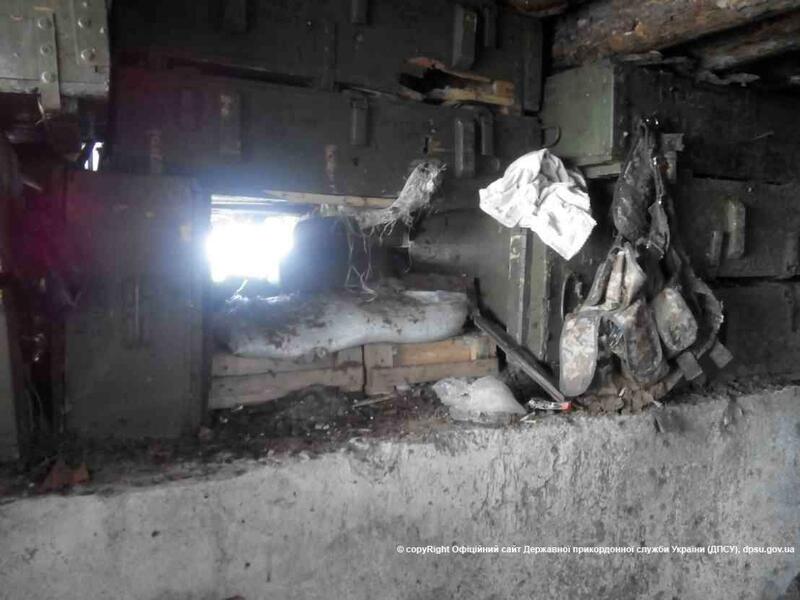 One grenade hit Stella located near the checkpoint, another grenade hit fortifications where Ukrainian soldiers were located. One soldier was wounded. Civilians were not hurt. It was decided to temporarily stop the work of the checkpoint. People who were crossing the contact line were taken to the safe area. Today Ukrainian authorities had to close one of the biggest checkpoints of Donetsk Regions “Marrinka” after numerous attacks from the side of pro-Russian militants of so-called Donetsk People’s Republic (DPR). 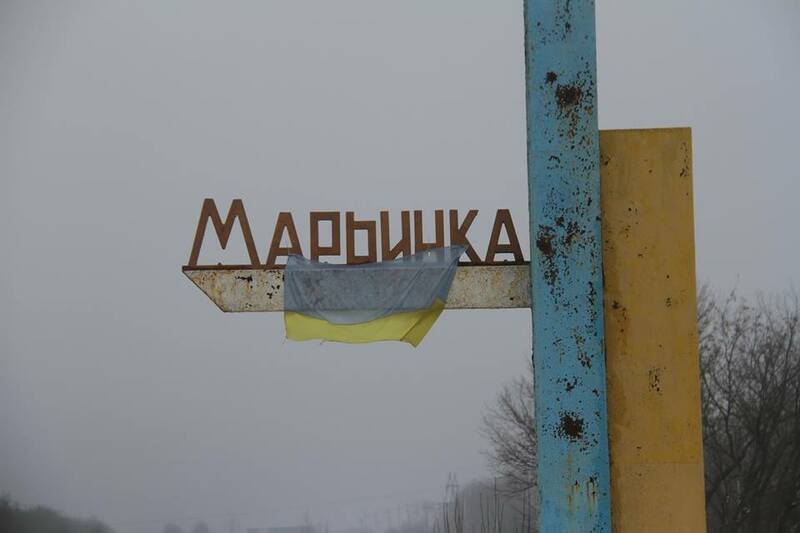 “Mariinka” checkpoint is one of the routes people were using to cross the contact line. Every day over 5000 people were going in and out of occupied territory of Donetsk Region. According to data released by State Border Guard Service of Ukraine 5480 people and 1235 vehicles passed by “Mariinka” checkpoint yesterday. Just in one week there were 98 attacks on positions of the forces of the Anti-Terrorist Operations near Mariinka villages and that was the highest number since the beginning of this year. So the life of civilians was in danger. The situation in Lugansk Regions got much worse in the last few days. At night pro-Russian militants shelled the checkpoint which is the only way for civilians to cross the contact line. Yesterday 2685 people passed by that checkpoint on their way in and out of occupied territory. See State Border Guard Service report. Terrorists used 82 mm mortars banned by Minsk Protocol. Militants also attacked Tryokhizbenka village using 82 mm mortars, automatic grenade launchers, high caliber machine guns and small firearms. 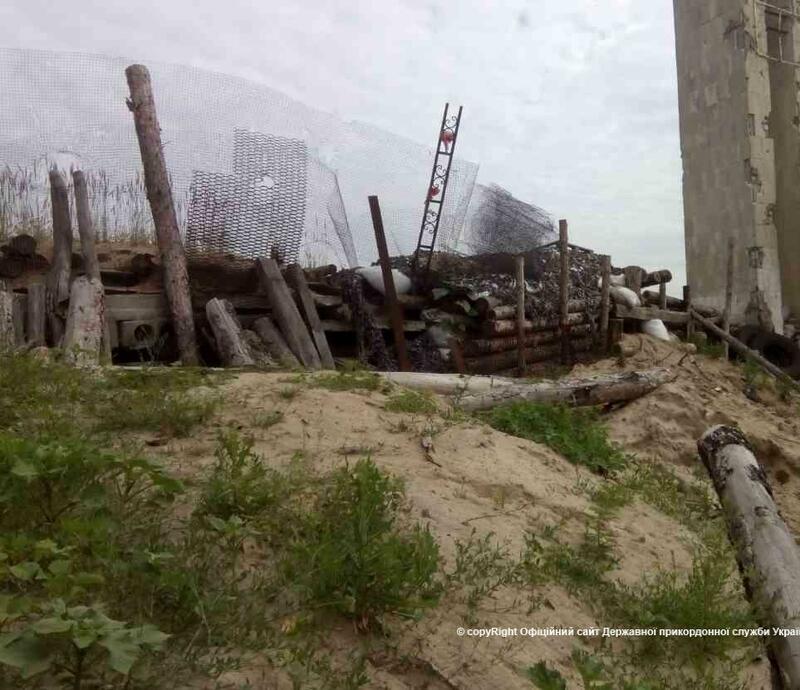 Yesterday on Feb 3, starting from 19:00 and for about an hour terrorists shelled Ukrainian fortifications in Tryokhizbenka near destroyed bridge, they used 82 mm mortars (about 50 shells were fired), automatic grenade launchers, high caliber machine guns and small firearms. The attack was from the direction of Krasnyi Liman (controlled by so-called Lugansk People’s Republic). There was no information about wounded or destruction. Also at about 21:00 terrorists shelled pedestrian checkpoint in Stanytsia Luhanska using 82 mm mortars. Most of the shells exploded near the bridge in “grey zone”, but some of them landed near crossing line on Ukrainian side. 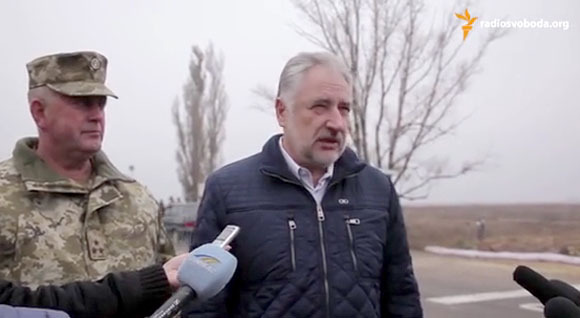 The Governor of Lugask Region George Tuka said that he was ready to close the checkpoint immediately as the life of civilians crossing the contact line there could be in danger if such shelling repeats. By after talking to military and border guards it was decided to leave the checkpoint open. In my opinion if there is any possible danger from the side of terrorist the checkpoint must be closed! In the morning I made a decision to close the checkpoint. But military and border guards offered to give “one more chance” in order not create difficulties to civil population. I repeat: our defenders voted for that decision, who (in my opinion) were supposed to be the 1st ones to offer to close the checkpoint… I would already close it. But I highly respect our military, so we will be making a decision together. Always! 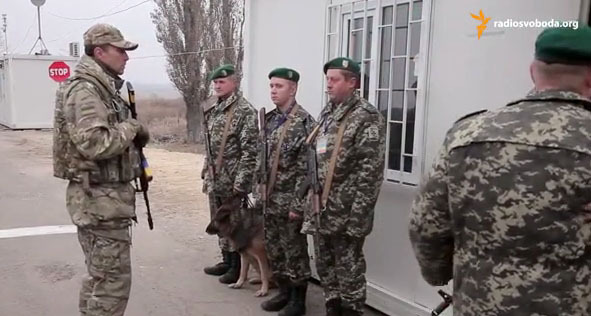 Today in the morning the head of Donetsk Regional Military-Civil Administration Pavlo Zhebrivskyi and the head of East Regional department of State Border Guard Service of Ukraine Col. Segiy Bidyl opened checkpoint “Heorhiivka” located near Kurakhove in Donetsk Region. See location on the map here. Border guards and servicemen of tax office will be operating together at that checkpoint and will control the flow of people, vehicles and cargoes going Donetsk direction and back. The checkpoint is located 4.5 km away from the contact line. The checkpoint operates from 09:00 till 17:00. 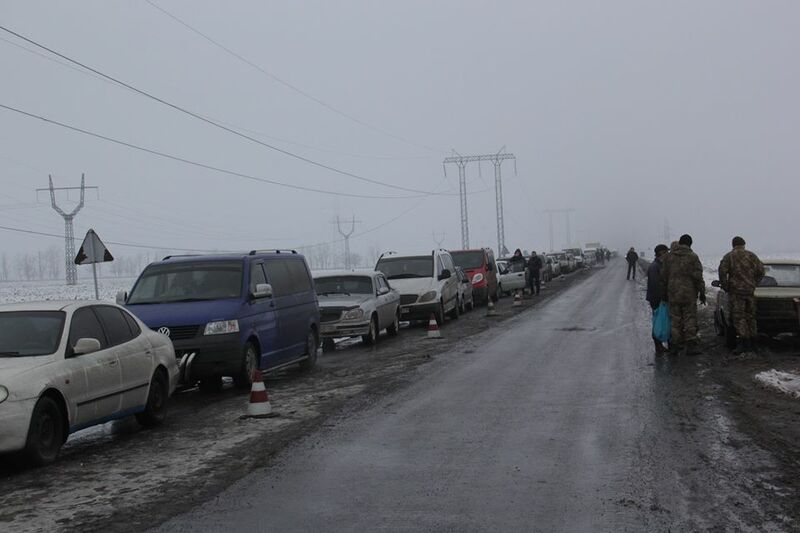 About 3 thousand people and 1200 vehicles can pass through the checkpoint per day. In June 2015 this checkpoint was closed because of the dangerous situation related to military activity in that area. The problem is that George Tuka opened pedestrian checkpoint in Stanytsia Luhanska, but we would like them to open the checkpoint for vehicles also, because half of the cars at our checkpoints are with plates of Lugansk Region. 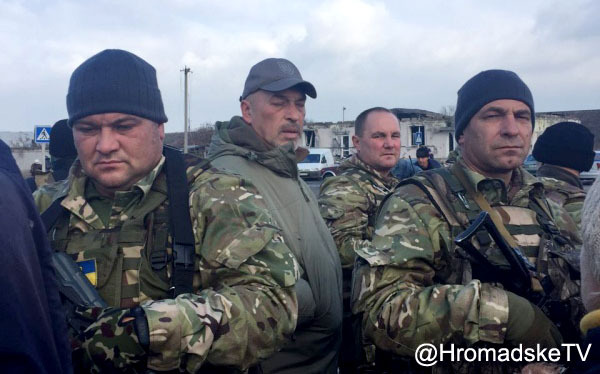 After that we will probably open new check point in Avdiivka. Right now ATO Staff together with Border Guard Service and Donetsk Regional Administration are thinking about increasing the capacity of “Hnutove” checkpoint located near Mariupol and plan to open checkpoint near Lysychansk in Lugansk Region. 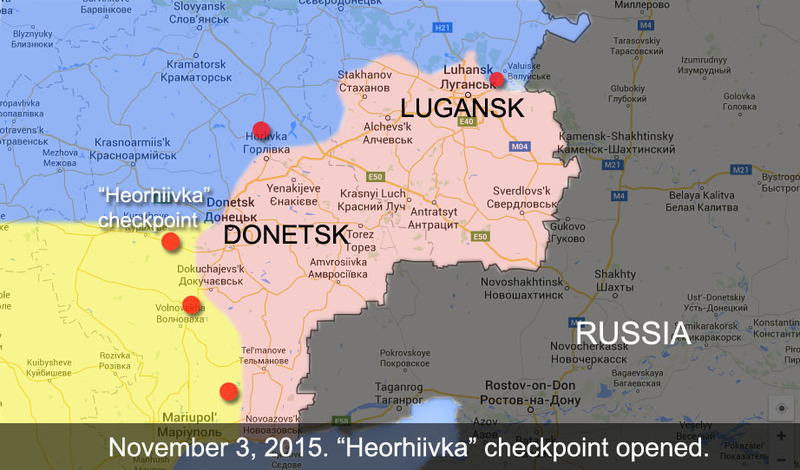 First checkpoint to occupied territory finally opened in Lugansk Region today. Now residents can cross the contact line and get to the territory controlled by so-called Lugansk People’s Republic. 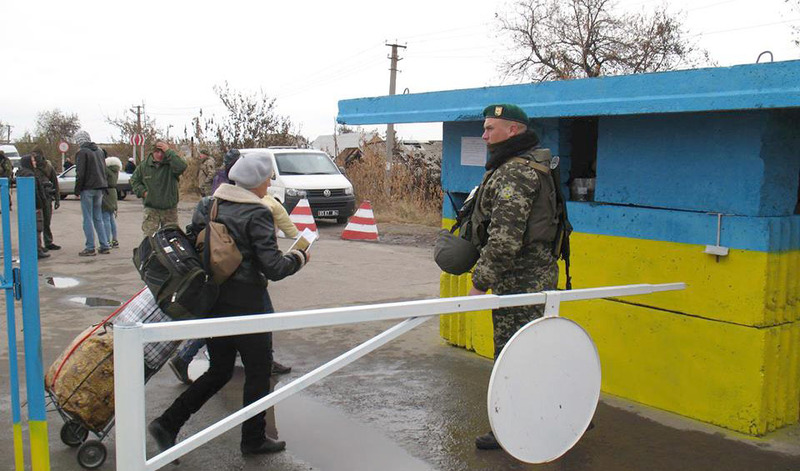 The checkpoint was opened in Stanytsia Luhanska. Before locals could get to Lugansk only through Donetsk Region or via Russia. The checkpoint opened today can only serve pedestrians, so it’s not possible to drive there. The head of Lugansk Regional Military-Civil Administration George Tuka personally arrived to the checkpoint to see how it works. It’s hard to overestimate the opening of the checkpoint as there was no single official checkpoint in Lugansk Region for a long time. That was because of several reasons. First of all the contact line in Lugansk Region goes along the river. The bridges were destroyed and at the places where it was still possible to go there were fights all the time. The checkpoint in Stanytsia Luhanska is for pedestrians only because the bridge is still destroyed. We also plan to open logistics center in Novotoshkivske and that will probably become fully operational checkpoint. We are also thinking about possibility to open checkpoint near Zolote. After talking to people at the checkpoint George Tuka said that the people mostly interested in the procedure of getting a pass. We are running information campaign explaining how to get a pass. Every time me, border guards and Security Service of Ukraine were emphasizing that people should get pass. We said many times that it will be possible to go through the checkpoint only for those who have a pass. Nobody will compromise on that. 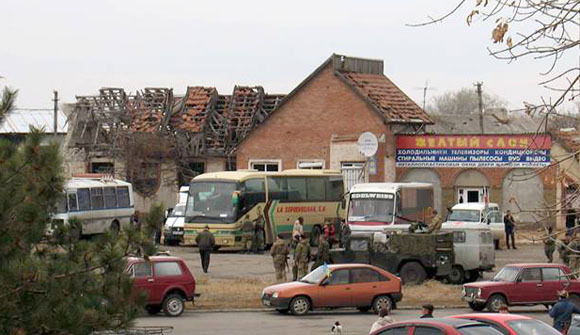 The head of administration of Stanytsia Luhanska Yuriy Zolkin said that state registries were unblocked in the city. So now it is also possible to get inheritance, do real-estate deals and other legal documents there.